Futurelooks drops by MSI to see what they have going on at CES. While many of the products like the HD 7970 and X79 Big Bang Xpower II have already been announced, it was nice to see these products in person and to get some additional information about their design and why they did what they did with them. However, the more interesting products were actually not on camera and we'll have a quick blurb about those as soon as you finish up with the video above (or directly on YouTube), available in 1080p HD of course! Apple MacBook Pro Users, Meet MSI's GUS! When it comes to games, Apple Computers are pretty weak sauce. Sure, their software is optimized for multimedia, audio, and video editing, but when it comes to gaming, PC reigns supreme. MSI saw an opportunity to go after this market with a product they call GUS. We saw a similar product to this one a few COMPUTEXes ago which allowed notebook users to upgrade graphics via the mini PCIe slot on their notebooks. With the right desktop graphics card and this special box and interface, users could upgrade to desktop grade graphics without opening up their notebook casing. With notebooks that could not be upgraded, this was a great product that got around the physical limitations. However, the product never made it to North America so it's nice to see the concept adapted to a market that truly needs that upgradeability. The GUS will hold up to an HD 5770 Radeon which is the highest supported GPU in the enclosure. The enclosure itself is finished in a Mac Pro like enclosure with the same finish quality. They plan to sell the box as a barebone, but hopefully they reconsider because Mac users tend not to be very DIY overall, and expect a plug and play experience. We've already seen a glimpse of the INTEL Z77 Series at the GIGABYTE suite, but MSI was just a little more hesitant to say anything on camera. 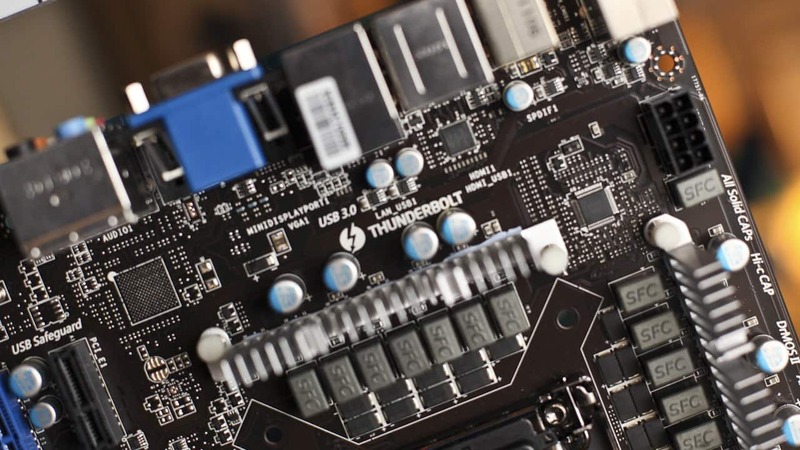 But from what we gather, MSI will be differentiating their boards on the higher higher end with Thunderbolt support while all the boards will now feature native USB 3.0 support. The Thunderbolt option on their GD80 won't be cheap and hopefully their gamble to put a distinctly Mac interface on the boards pay off. We're only just seeing peripherals trickling out into the market so hopefully this move to differentiate is the right one.